The best method for ridding your lawn or garden of dandelions or other long-taprooted weeds is pulling them out. The trouble is, it's very difficult to extract the entire root. The best solution I've found is a handy tool called the Weed Hound. Not only does it allow you to do the job without getting on your hands and knees, it's also is very effective. To operate, you simply place the business-end of the tool on the center of the offending weed, then step on the foot tread. Pushing the tread down causes a ring of steel spikes to plunge into the ground around the tap root. Then simply lift straight up, and you'll extract the entire weed and root every time. 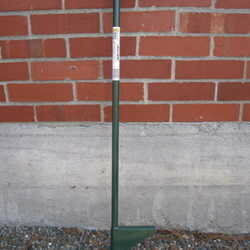 Releasing the weed into your barrow or bucket is done by pushing down on a knob at the top of the tool. The entire evolution takes about 5 seconds. After lending my Weed Hound to my neighbors, they were so impressed, they've all gone out and bought their own. After several years, our neighborhood almost a dandelion-free zone.